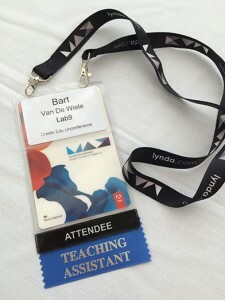 I just got back from my first Adobe MAX 2014 in Los Angeles and have to say I was impressed with the event organisation. Long time ago I attended the only 2 MAX editions that were organised in Europe. These were in Barcelona 2007 and Milan 2008. But the original MAX in L.A. is a whole different ball game. The scale of the event was a lot larger and felt better organised and more professional. Just like the previous years Adobe chose the L.A. Convention Center as their primary location for all the networking, sessions and hands-on labs. While the main keynotes and “Sneaks” were held in the Nokia Theatre across the street. 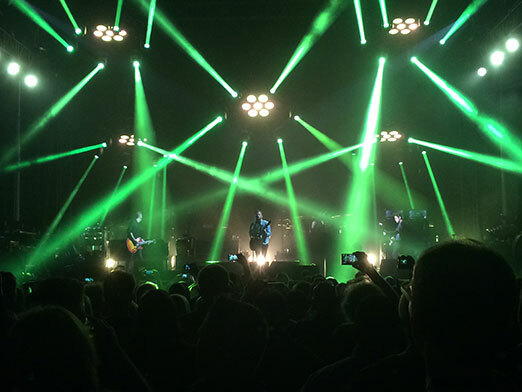 And these facilities were easily able to hold the nearly 5.000 attendees while keeping them happy and entertained. 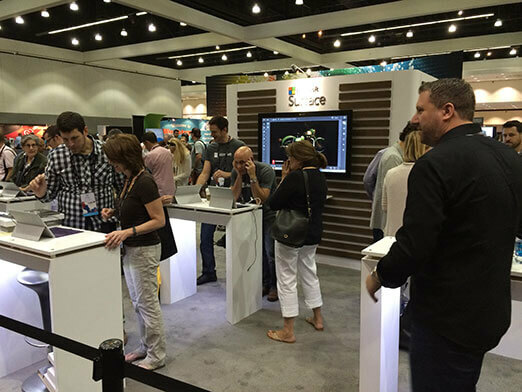 Here’s my Adobe MAX 2014 report. 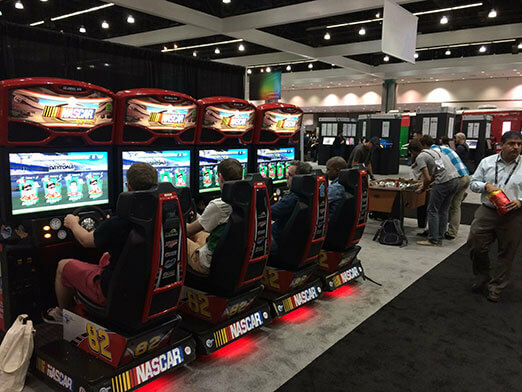 The main MAX event took place on monday to wednesday, 6-8 October, but was preceded with 2 days of pre-conference sessions on saturday and sunday. 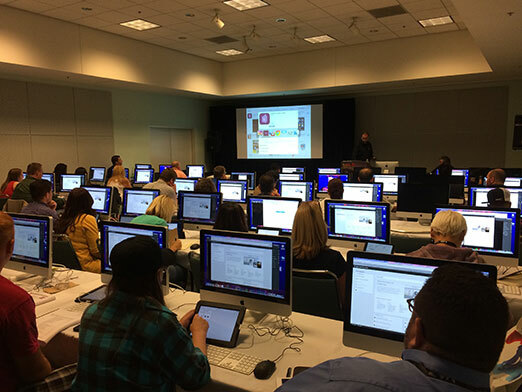 These sessions allowed you to deep-dive into specific topics like Adobe Photoshop techniques (with mad professor and Photoshop expert Russel Brown), Adobe DPS and other hands-on labs for a full day. These labs came fully equipped with Mac or PC computers and provided iPads if applicable, and this for rooms to up to 70 attendees at a time. Of course you can’t just expect every attendee to have the same pace when clicking or following instructions so Technical Assistants (TA’s) were used to support any attendee that might get into trouble or got left behind during an exercise. For my first MAX I was lucky enough to have been invited as a TA to support 5 of the Adobe DPS sessions. And because of this organisation, some of the sessions felt like a well oiled machine. Equipment was provided, printed handouts distributed and extra information was passed on by sharing URLs or a DropBox folder. I got there on friday night after a long 25hr trip (yes there were flight delays involved) and started my “shift” on the sunday pre-conference session. After having picked up my attendee badge on monday it was time for the main Adobe MAX event to start . The main keynotes were held in the Nokia Theatre, about a 5min walk from the L.A. Conference Center and after about a 10min queue in the hot Californian sun (that was a seriously hot day) I was able to claim a nice seat with a view onto the main stage. After the spectacular MAX introduction video it was time for Shantayu Narayen (Adobe’s CEO) to jump on stage and talk about Adobe’s focus for the coming year. Apart from the very cool new features for our favourite Creative Cloud products it seems that the main Adobe message had to do with tablets and mobile devices. And a few demos on the mobile interface of Adobe Illustrator on the Microsoft Surface Tablet 3 did convince me that this device can be used as a tool for designers. And who was better to explain this than Microsoft’s CEO himself, Satya Nadella. Adobe and Microsoft also announced an upcoming partnership and work together on upcoming technology. I’ve always been a Mac guy and would never go back to Windows. I love my iPad and iPhone and know they’re not perfect, but what device is? And I think that Adobe also knows that a lot of designers are Mac users so how can Adobe and Microsoft start convincing designers of exploring or test driving Microsoft technology? Well, giving all 5.000 attendees a free Microsoft Surface Pro3, a Surface Pro keyboard and a year subscription to Office 365 sure helped. I have to say I’ve never seen 5.000 people (of which most were Mac users) give a standing ovation that fast. The Surface Pro came pre-installed with Adobe Illustrator and Adobe Photoshop so designers could test drive their new toy the moment they opened up the box. Good move Adobe and Microsoft, and thanks! The rest of the monday morning keynote showed off a few of the new features that Creative Cloud had to offer including the new mobile apps (read on for more about those). Ami Vitale: who shared her life experience as a photographer and the magnificent things she’s encountered while living in conflict areas like Afrika, Kashmir and other places. The stories she had and the images she showed us were moving, sometimes sad but also sometimes pretty funny. Weird Al Yankovich: Weird Al isn’t that well known in Europe but I do remember him from many years ago. I watched one of his films when I was a kid and always thought his parody music video’s like “Eat it” were hilarious. Then he seemed to have dropped off of the radar for a long number of years and it’s only recently that his internet videos caught my eye. Weird Al talked about creativity, the industry and how important the internet has become for his business. Lee Hirsch: a moviemaker who has started a nationwide campagne against bullying. After being bullied himself as a child he took it upon himself to help other children and create awareness of this phenomenon that sometimes even drives 11 year olds to commit suicide. His session was pretty emotional and he was able to promote his upcoming movie “Bully” to the audience. 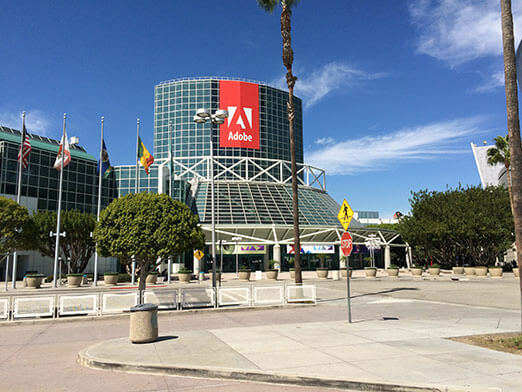 And to help him out even more Adobe decided to donate $5 for every tweet that had the hashtag #AdobeMAX that morning. And after having seen the amount of mobile devices in the room I’m sure they were able to raise a lot of money. Thanks to growing screen sizes and spectacular increase of technical performance Adobe was ready to launch a total of 7 new mobile applications. Applications for drawing, creating Photoshop brushes and even compositing video for Adobe Premiere, it looks like creative designers have more tools (or should I say toys?) than ever to express themselves using their mobile devices. Personally I’m not entirely convinced yet about all the applications that were presented that morning. I really like a few of these applications like Adobe Brush to create custom brushes thanks to an intuitive touch interface and your camera. Or quick video compositing using Adobe Premiere Clip. But some of the apps like Adobe Shape, which allows to trace over objects with vector curves directly from your camera, don’t really seem that productive to me. Sure they’re fun to play around with but the idea of using it as an accurate production tool for recreating shapes or objects with vector curves doesn’t fly with me. But whatever happens, my main hope is that Adobe will continue to support these mobile apps instead of discontinuing them after 2 years like we’ve seen with the previous generation of Adobe mobile apps. But I do have to say they seem to have given these apps a lot more thought then the previous generation of apps. I’ve never seen so many different sessions and speakers before during an event. With around 200 speakers and around 300 different sessions and hands-on labs there surely was something for everyone to enjoy. Of course there were repeats in case you had conflicts in your personal session agenda, plus not all sessions were technical. There were also enough speakers that only talked about trends, creativity and inspiration. Most of the sessions and speakers I saw were pretty good and the presenters were able to manage themselves quite well on stage. Some might have been a tad boring but others were hilarious. Because I was TA’ing 5 sessions throughout the conference I wasn’t able to attend as many sessions as I wanted to myself. But the learning experience from helping out during the presentations did make up for that a little bit. The sessions I did manage to attend had to do with Adobe DPS and others with HTML5 animations since I wanted to learn more about HTML for future tablet publishing projects. But I’m happy with the sessions I was able to assist and even got to present a specific section of the DPS App Building session together with Bob Bringhurst. Everyone got spoiled at MAX. The food, drinks and especially the service was great and I can’t really see how anyone could have had any complaints. 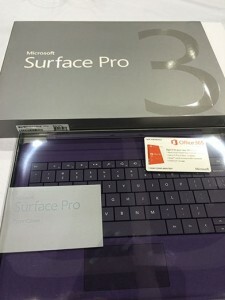 Everyone received a free Surface Pro and was able to take advantage of other commercial deals that were offered by the sponsors in the Community Pavilion. 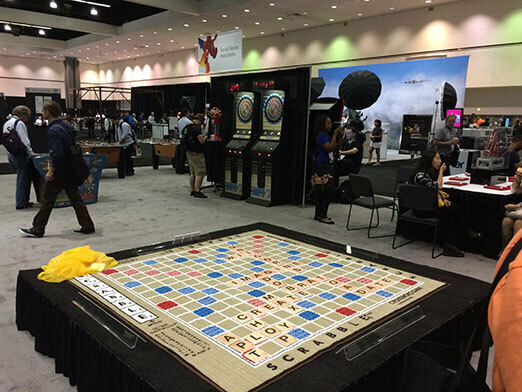 The pavilion also allowed you to take a break and just have fun between sessions. There were craft tables where you could be creative with objects, paint and glitter, you could build your own lego race car and test it on the track, play huge versions of scrabble, play video games, design your own t-shirts, challenge someone in a Photoshop show off, get your professional picture taken for your social media profile or just sit and relax on one of the swings. And then there was the evening entertainment. 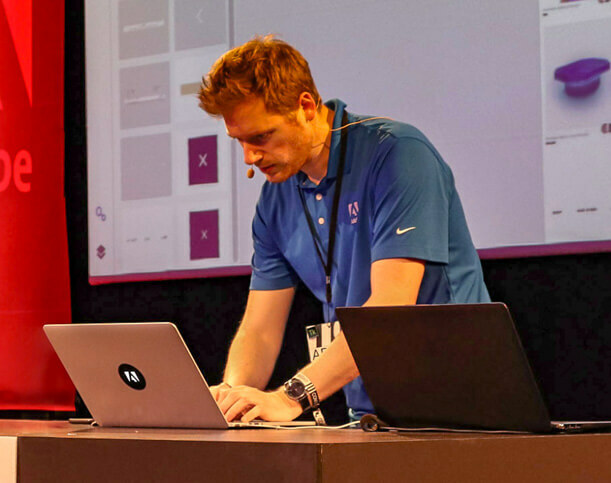 On tuesday we all got to enjoy Sneaks, a one hour session in the Nokia Theatre where Adobe shows off the new technology they’re working on. 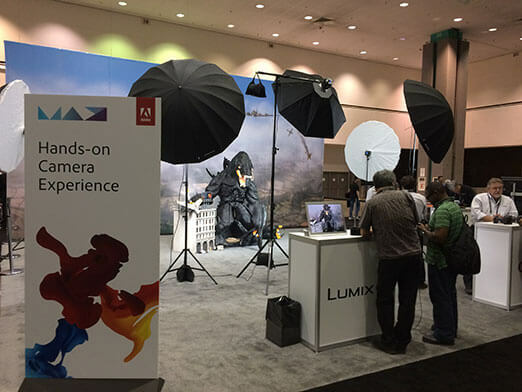 This session was hosted by Adobe’s Ben Forta and actor / director Joseph Gordon-Levitt. 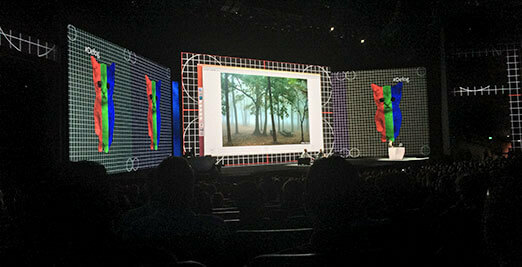 The technology I saw was pretty spectacular and I’m very excited about what Adobe is going to do with it. Part of the charm was that the presenters for these new technologies were the actual developers themselves. Most of them had a very strong foreign accent but were still able to do their presentation in English, sometimes by adding a lot of silly jokes. And then it was time for the infamous MAX Bash. Adobe rented the outside area in front of the Staples Center (which is next to the Conference Center) and transformed it into an open air party. And there you could find an open bar, great food, dance music, light effects and art. Not to forget the 5.000 people who were up for a party. And the cherry on the cake was a 45min private concert from Kings of Leon. Not too shabby for an industry conference. Sessions: my primary focus is of course learning and attending sessions. So I need to be sure that I’ll pick up tips, new programs, or a new (or updated) sense of direction. Organisation: because I’m personally involved with organising small events in Belgium I think attending sessions overseas gives me a great learning platform because I get to be an attendee myself. So the personal experience I get as an attendee helps me to get things organised for my own sessions and events. The things I pick up could be about how I enrolled, how communication is done, their social media policy, surveys, catering, support, etc. 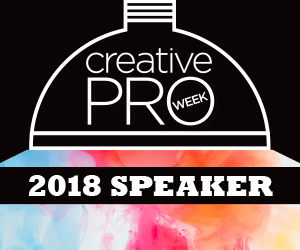 Speakers and keynotes: because I regularly spend time in a classroom environment or on stage as a speaker I constantly pick up tips on improving my own presentations, my slides, technical setup and even get to observe how people improvise, answer questions, introduce themselves or (try to) be funny. Networking: the previous bullets in this list are pretty straightforward and most people just go with the flow. But networking is different and I do believe that the word “work” in “networking” is a true fact. And it sometimes takes some courage to let yourself be heard during a session or just step up to someone out of the blue. But I’ve learned that growing your network and socialising with specialists, Adobe staff and like-minded people is key to growing your own business and staying at the top of your game. And at MAX I was able to do that. I was finally able to meet a lot of Adobe staff that until now I had only “met” only by following each other on Twitter, LinkedIn or by email. And of course I got to hang out with many of my friends and “colleagues” again like Mike Rankin, Sandee Cohen, Nigel French, Keith Gilbert, David Blatner or Anne-Marie Conception. But though you have a great opportunity to do networking it does seem that Adobe wasn’t actively driving this. For this I think a conference like PePcon does a far better job where the sense of a community was also a lot stronger. Being back home I can say that the trip to Adobe MAX was well worth it. I know that not everything is as awesome as it could / should be e.g. certain sessions could have been better and I had to travel around 25 hrs to get to Los Angeles. But still I think MAX is the type of conference where you have to make it work for yourself. You have to step up, take certain initiatives and make sure you can reach your goals during the days of the conference. I have learned several new things and am happy that I can tick all four of the boxes that I described in my previous paragraphs. So I’m very much hoping to go again next year, preferably as a speaker since I’m convinced I can bring a few very interesting sessions to the table. Wow! That was an incredibly comprehensive synopsis, Bart. I for one appreciate you taking the time to describe what was portrayed, what you liked and didn’t like, who presented and what they presented, new tools and trends, etc. since I wasn’t able to go this year. Through your descriptions I feel like I got some really good insight into what I missed. Hopefully you got some of this blog done on your 25-hour plane ride (or maybe you just slept… I certainly wouldn’t blame you!) and I’m glad you got to spend time with some PePcon peeps while you were there. I’m impressed you read the whole thing Didn’t really expect anyone to go that far, thanks for your feedback Pam! Hope we can both be there next time! Wow! This sounds exciting! What are the perks of being a TA? Do they pay for your transportation and hotel? Or do you have to come up with those expenses? I’m afraid Adobe doesn’t pay for the expenses. Thanks for responding! That’s ok, they will be covered. I just wanted to make sure by who. Yes, I’ll be speaking actually. I’m hosting 3 InDesign Deep Dive lab sessions. Gonna be so much fun! That’s so cool Leo! Congratulations! Wow – Captcha’ gettin’ intense asking “5 – three =”. Nice. I read this post to get hyped for the conference, as I’m attending Max for the first time this year (so pumped!!!). It was an early birthday gift from the wife, so I’ll be heading in alone (I work in higher education and do a lot of work with the Adobe suite in the office). 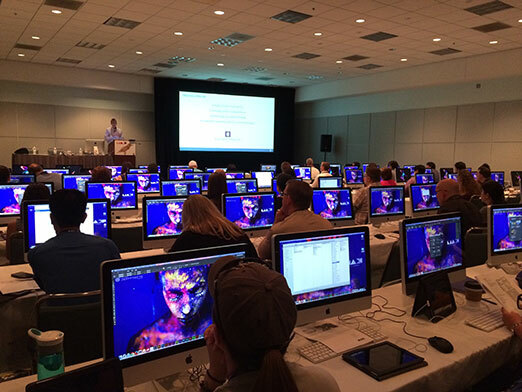 As helpful and fun as this article is, it made me remember again that I missed the session I really wanted to attend – the InDesign Deep Dive! Thanks for the synopsis. I’m even more pumped. And also more aware. I’m hoping I’ll be able to delve further into networking. I feel a little outnumbered as while I’m a huge Adobe fan (InDesign is like a special coworker to me), I work in a setting and with additional roles that go well outside graphic design. Glad this conference will keep me to it. Too bad you won’t be there for my ID session. But there’s always a good chance we might run in to each other. See you there!